Before TAP: The 1963 Vision Of Smart-Card Fare Collection And Rapid Transit For L.A. The Metro TAP Program has been in the news quite a bit lately, and it reminded us of a long-forgotten piece of Los Angeles transit history. 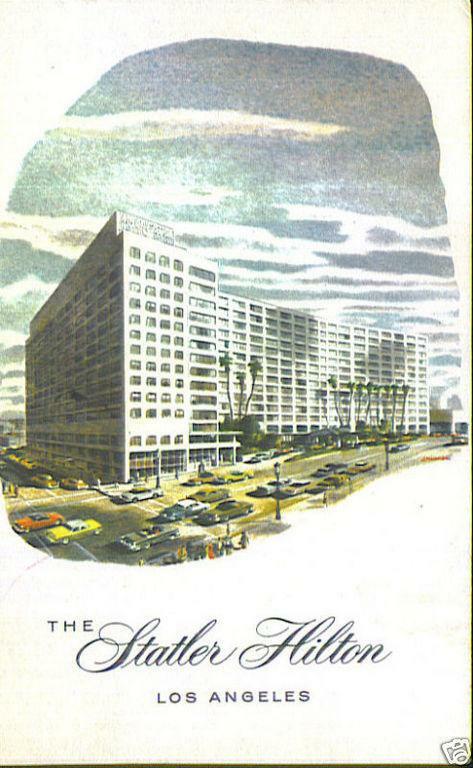 On January 7, 1963, local business and political leaders gathered at the Statler-Hilton Hotel downtown to hear a presentation on the need for a rapid transit system in Los Angeles. While countless traffic plans and rapid transit solutions for our region have been proposed as far back as the 1915 Study Of Street Traffic Conditions In The City Of Los Angeles, the Rapid Transit: …A Reality (53p. PDF) document of 1963 deserves special mention for a number of reasons. He shows his individually coded credit card to the magic-eye fare computer, is admitted through the turnstile concourse and is taken by escalator quickly to the train platform. A computer-tabulating device will automatically record his entrance and his exit and he will be billed automatically for his total mileage at the end of the month. So what happened to this vision? Gilliss’ appealing portrait of hassle-free and stress-free commuting sounded too good to be true – and it was. Despite the appeal of an alternative to new but congested freeways (and “Sig Alerts”), the following year, the California State Legislature recognized that they had granted limited authority to the Los Angeles Metropolitan Transit Authority to solve Southern California’s transit problems. As then constituted, the Authority would be unable to deliver the needed comprehensive mass rapid transit system. LAMTA did not have the power to levy taxes for any purpose whatsoever, its Board did not wield sufficient political influence to build broad public support, and it did not have the right to acquire real property by eminent domain. While it could issue revenue bonds, it did not have sufficient revenue sources to implement a large-scale system with broad local support. The following year, the California State Legislature approved a bill authored by Senator Tom Rees (D-Beverly Hills) creating the Southern California Rapid Transit District (SCRTD) in order to ensure that sufficient resources would be available to build a true mass transit system for Southern California. The notion of smart-card fare collection fell by the wayside, as the last of Los Angeles’ streetcars were put out to pasture the year before, and true rapid transit was still 25 years in the future. The concept was renewed in the 1990s when technology caught up to the vision put forth here, and transit agencies around the world began looking at new methods of electronic fare collection. “We only wish somebody would complete some one of the many proposed rapid transit lines and put it in operation.” How many times have we, in the public transportation business, heard this plea? But these are the words of a prominent writer that appeared in the Los Angeles Times on November 5, 1888. Since that time, the 19th Century version of a rapid transit system was actually built and it served well for 50 years. Many of you will remember the shrill whistle in the distance and the clanging and rumbling of the train as it passed. It served its purpose until a new, convenient, and flexible transportation tool, the automobile, began shaping the living, working, and travel habits of all of Southern California. Then thousands of new streets laid over the train tracks brought millions of automobiles to impede the progress of those wonderful old trains until the system died. It was made obsolete in many other ways. For one thing, the remarkable success of the freeways has taught us that any successful commuter facility must travel on its own free right of way. Look, too, at the almost unbelievable technological advancements of the last 20-30 years. They make possible new and fantastic 20th Century systems that are hard even to imagine. The car, the station, the track structures I will briefly describe to you today are as modern as an orbiting space craft, and could no more be compared to the 19th Century train than one can compare the 1963 Thunderbird with the Model T Ford; or the 19th Century Hall of Records on Broadway to the new Hall of Administration. What we will build in Los Angeles is the most modern mass rapid transit system in the whole world. The basic design of the car was adopted after many meetings with leading aircraft manufacturers, electronic specialists, railroad construction engineers, electrical equipment firms, transit designers, and “monorail” developers. Every possible technological development was investigated to assure that the system would provide the highest of speeds, operating efficiency, passenger comfort and convenience as well as engineering flexibility and safety. This system is designed, quite frankly, to compete with the automobile, not for space on the already crowded streets and highways, as our buses must do today, but to compete with it for passengers during commuter time to relieve those streets and highways. As Mr. Robert Bradford, Chairman of the California Highway Commission, has said last week, his highway engineers are estimating highway needs on the assumption that Los Angeles would join the San Francisco Bay Area in building a rapid transit system. He went on to say he believes the average California driver will take less time getting home from work in 1980 than now; but he emphasizes that this depends on one fundamental condition – mass rapid transit in metropolitan areas. This system we build, then, must compete in attractiveness and convenience with the private automobile in order to relieve the streets and highways of thousands of peak-hour commuters. There is a booklet at the door for each of you containing more information than time will permit today, but I would like you to take a trip with me now an your new system. The employee or the executive in the Tishman Building on Wilshire Blvd. leaves his office and building at 5 o’clock. This is the time when everybody else is trying to find his car and move it out through the churning stop-and-go traffic toward his home. Our commuter goes through the unobtrusive subway station entrance on the corner and takes the escalator to the brightly lighted, attractively decorated and tiled mezzanine. He does not need a timetable because trains operate at 90-second intervals in peak hours. He shows his individually coded credit card to the magic-eye fare computer, is admitted through the turnstile concourse and is taken by escalator quickly to the train platform. A computer-tabulating device will automatically record his entrance and his exit and he will be billed automatically for his total mileage at the end of each month. He has missed his train, but in the time it takes to buy his newspaper, another train is there. He enters quickly through one of the several entrance doors in the eight-car train as the train makes its 20-second stop. He seats himself comfortably in a wide contoured upholstered bucket-type seat. He is aware of the soft background music and the automatic announcement of travel information and station stops. He is aware of the bright and beautiful and attractive interior and the diffused air conditioning without drafts. The fluorescent interior light is soft and without bright contrasts. The wide and deep windows provide a maximum view from the interior and through the whole train. They are safety-plate glass, tinted, laminated, and heat repellent. Our friend can hear the soft background music or the conversation of his companion because the new vehicle was especially designed for interior quietness. It is virtually silent and vibration free. An insulated floor muffles any sounds from the wheel-track contact, and a skirt of special sound-suppressing construction runs the full length of the train to muffle and restrict the transmission of noise to those outside. The trucks are also equipped with vibration-isolating devices. Rubber insulation pads are used throughout the construction of all the auxiliary components. The gear and compulsion components are of advanced quiet design. Our commuter is literally riding on air. An air spring control suspension system adjusts automatically at each load change in order that the car body level remains constant. He may not notice that the track incline is slightly downward leaving the station and slightly upward approaching each station to assist in smooth acceleration and dynamic braking. The train accelerates quickly and moves swiftly from station to station governed entirely by a centrally located electronic computer — a-la John Glenn. This automatic system is fail-safe. The MTA attendant is along mainly to reassure the passengers – our traveler moves at speeds above 70 miles an hour & even with stops, his average speed is 35 to 40 mph. In the time I will spend telling you about the equipment and the system and in the time our commuter has taken to read his favorite newspaper, his station at Rosemead Boulevard has been called. He has traveled in subway from along Wilshire Boulevard through the downtown civic center area onto the median strip of the San Bernardino Freeway moving along freely on his private right-of-way while his neighbor on the freeway in the bumper-to-bumper struggle to get home hopes fervently that there will be enough highway funds next year to complete the Pomona and the Foothill Freeway so that these “other motorists will get off his freeway,” — or perhaps, he too, next time, will try the train. Our commuter will leave us at the Rosemead Blvd. station; walk over the outbound freeway lanes into the attractive and spacious station and free parking lot area. Whether he is a park and ride or a kiss and ride commuter, or whether he travels from his home area to the rapid transit station on the frequent schedule of the feeder buses moving through the less congested suburban streets, he arrives at home comfortable and relaxed, and we know that he will be with us tomorrow morning, for he has learned that this new service is as simple to use as his new office elevator, and he knows that if he boards the train at 8:00 in the morning he can be at his desk by 8:30. The trip has cost him the same as a 1963 bus fare. The 16 miles has been covered in 23 minutes with no traffic lights or Sig Alerts. We have taken an imaginary trip today – the trip will actually be made by thousands of commuters in 1967. The Long Beach extension will be finished April 1967 – in time for the World’s Fair. The whole 4-corridor system will be in service by July 1969. The rider may then move from UCLA, from north of North Hollywood, from East of El Monte, or from the Long Beach-San Pedro area to any one of 52 stations along the 4-corridor system. Slimline Skyway structures with supports of light weight materials and pre-stressed members made possible by dramatic new construction techniques will grace and beautify the San Fernando Valley and Long Beach Lines. The Wilshire Blvd. Line will be in subway – along the San Bernardino Freeway median strip, the train will travel at grade. A secondary distribution system will serve the growing Civic Center and the Bunker Hill high-rise redevelopment project. Hollywood – Beverly Hills – Monterey Park – Compton are some of the way points in the system which will take roughly half of its passengers along one leg or all the way through the congested central area. Construction of this system will be one of the largest projects ever carried out in Los Angeles County. It will provide employment for an average of 3,000 people annually over the six-year construction period. The peak labor force will reach 5, 000 during the height of construction. The project will require 220,000 tons of steel, 1,700,000 cubic yards of concrete, 2,000,000 barrels of cement, over 60,000,000 board feet of lumber, and almost $60,000,000 worth of electrical and electronic equipment. Actual construction would begin early in 1964 following the preparation of final designs, purchasing of rights-of-way and the acceptance of contract bids. The first transit line would be in operation in October, 1966. The system would be completed by July, 1969. The new system in Toronto, Canada has proved without question that a modern mass rapid transit system adds value to the surrounding property and the property it serves in a measurable and substantial way. That will happen also in Los Angeles. The real question comes – who is going to ride it. Who is going to get out of their car and actually ride a mass rapid transit system? Your opinion and mine is only opinion and not dependable enough for an investment of this size. Just as any prudent businessman would do before starting a major project or marketing a new product, we have made a massive market survey. Some of this survey was made in cooperation with the City Traffic Department, the County Road Department, State Division of Highways, and others interested in an integrated transportation system. We have employed also the best independent brains in the world with the greatest possible experience in projecting the number of passengers that would use such a facility. They have previously conservatively and successfully estimated and projected the traffic for the San Francisco Bay Bridge, the new Carquinez Bridge, the New Jersey Turnpike project, Sunshine Parkway project, and other similar projects. Their survey and study has been made in depth – and their opinion will sell bonds. The result, of our own modest efforts has also supplied reassuring evidence that people will leave their cars and ride new and modern and speedy service. Three years ago we provided a freeway flyer from the San Fernando Valley. It began with 4 units and now some 15 units a day are required to handle the patronage on that single line. Wherever possible in the recent San Fernando Valley service improvements, MTA established express and limited service on principal lines. The response was immediate. On one line patronage increased 39% – on another, 32%. These are new riders who have left their cars in their garages to ride buses which cannot expect to compete in travel time with the automobile. These and other experiences we have had recently encourage us greatly that the experts do know what they’re talking about when they say that, with a modern and fast mass rapid transit system, many, many people will leave their cars at home at commuter time. If your travel requirements are such that you cannot and, therefore, will not use the system, remember that those who work with you, those who serve you in the stores, those who come to shop at your stores, those who work in your home, those that provide the services and goods will use it and, to the extent that they use it, they will make the freeways and surface streets free for your use. Our rapid transit line can carry 5 times as many commuters and occupy only 1/4 the amount of right of way necessary for a modern six-lane automobile freeway. I say it can carry, because it can only carry those passengers if they ride the system, and that is the very reason that the system is designed to serve the congested area at commuter time. Such a service will help to relieve all traffic in the Los Angeles Basin. Off-peak service will be a community bonus. The mystery traffic jams on freeways are not mysteries to the transportation engineer. He knows that a completed street highway and freeway system plus a rapid transit system will answer most of those Sig Alerts. We might consider what the alternates are. Frankly, since the freeway system to serve the congested core area depends on one fundamental condition, more mass rapid transit in metropolitan areas; there is no satisfactory alternate. The community cannot afford to build the additional freeways downtown that will be needed to carry only commuters. The high construction cost would delay the construction of many miles of freeway connecting links needed to complete the planned 1980 freeway, and needed to provide access and convenience in areas such as the Antelope Valley. These freeways are doing the job and more than the freeway planners expected but they need help at commuter time. We propose to give the community that help in the most modern, attractive, efficient, speedy, silent, and safe system that can be designed by the best talents available. The system has been laid out. It is the foundation of a total system that can be built and adapted with extensions as the population and traffic make it desirable. It can be built, it must be built — if not today, it will be built at a later time out of sheer desperation. What an opportunity we have to make Los Angeles the most convenient place in the world to live and be in business. May I now direct your attention and interest to Mr. Gerald Kelly, General Counsel of MTA who will answer the important question – what will it cost and how do we pay for it. Overall, we can see that some of the age-old issues in Los Angeles transportation evolve very slowly. A perfect example of that from this same report would be rapid transit reaching from downtown to Westwood. Projected completion date: January, 1968.